Vale SA of Brazil said it has increased access of its Valemax iron ore carriers to Asian ports. The company even docked one of its ships in China where a ban on the giant vessels has been in effect for more than a year, Reuters.com reported. Reuters reported on April 18 that the Vale Malaysia docked at China's port of Lianyungang April 15 and left April 17 after unloading its cargo, but the 402,285 deadweight ton (dwt) ship, one of the world's largest bulk freighters, was only partly loaded. The company hopes the giant ships will help slash costs of shipping ore to China, the world's largest iron ore market and compete with Australian rivals BHP Billiton Plc and Rio Tinto Plc, whose mines are closer to Chinese customers. Though most of the vessels were built in China with Chinese government finance, alleged safety concerns led China to ban the Brazilian miner's mega ships in early 2012 after a Korean-built Valemax developed a hull crack on its maiden voyage, Reters said. The ban also aimed to protect China's industry against an overabundance of vessels that stifled global shipping rates. Under the ban, no bulk cargo vessels of more than 300,000-dwt have clearance for Chinese ports. 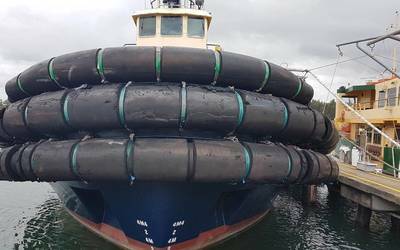 The 35 Valemax vessels afloat or under construction -- the last is scheduled for delivery this year -- can reduce transport costs by up to a third and produce far fewer greenhouse gasses. Vale owns part of the fleet and has given third-party owners long-term contracts to ship ore with the rest. In April, Vale opened a second floating iron ore distribution station in the Philippines to keep the Valemax ships working despite the Chinese ban and to make sure Valemax ore can move to ports that are not deep enough or properly equipped to handle them. The floating bulk freighters with ore-moving equipment have the capability to transship ore from the Valemaxes to smaller vessels for the final trip to Asian ports. Vale is also working to open new ports to Valemax ships in Japan and Korea.